We have four major categories in our product line-up, being our hugely successful orchestral line, our ethnic line, our vocal range and our 'heritage' line. This product falls squarely in the latter category, being culturally intertwined with the white peaks of the Alps as much as the Carousel organ is indigenous to the streets of Amsterdam or Brussels. This instrument, recorded on location at the Alphorn Centre in Friesenheim, the south of Germany, and played by renowned player and Alphorn builder Franz Schüssele, is an inspiring mix of nature and craftsmanship, producing silky smooth soft tones and rattling shouts alike, sounding a bit like a very warm brass instrument even though the whole thing including the mouthpiece is made of wood. We had a great time with Franz trying to capture all the intricacies of this amazing instrument, and we think we succeeded, in the Sonokinetic style, warts and all, to make for a very original and natural sounding approximation of the real thing. Since the Alphorn has no valves it only plays nature-tone harmonics, in the case of this instrument upwards from a low F. Some of these harmonics are not exactly tempered to our modern ears (most notably the one between Bb and B, and between Db and D). However sounding very off key in these cases we thought it good to offer a version of the instrument as you would get it with a real Alphorn player, so the ‘Natural’ version of the instrument we left unturned. The added benefit of this approach was that we could also add recorded legato transitions of up to three octaves (!) up and down for the natural instrument. 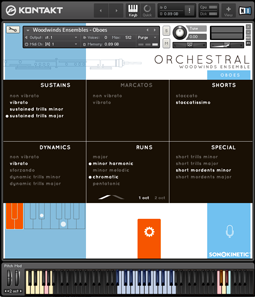 For general usability we also made an ‘Extended’ version, mapping the samples over the missing notes, and tuning it in kontakt. This extended version is multitimbral, and capable of producing amazing beds of Alphorn ensemble sweetness. Further controls in the instrument are very basic, with a ‘growl’ control and a basic EQ and IR reverb. 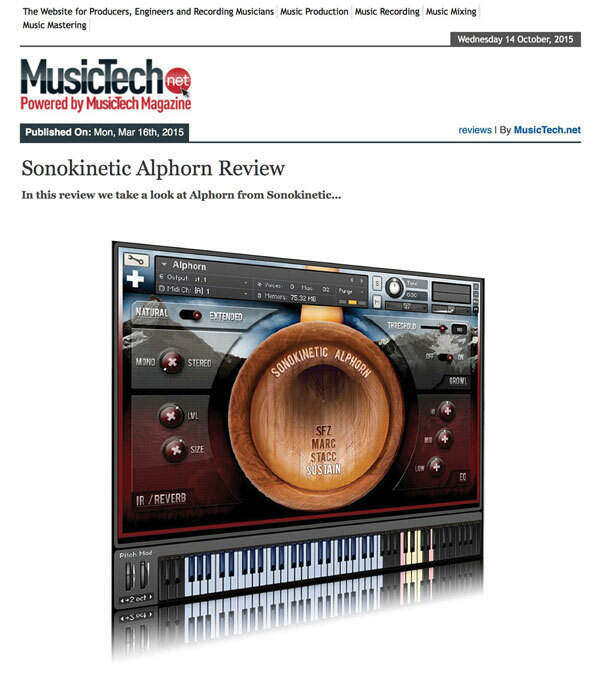 We, at Sonokinetic BV, are very proud to introduce Alphorn to you, and can’t wait to hear the amazing things you, our valued customer base, will produce with it. 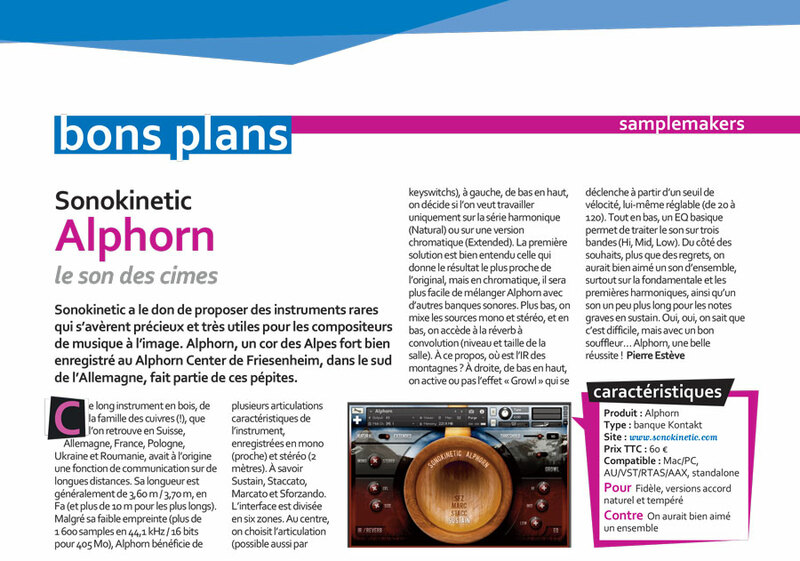 On the left, it is the main interface for Alphorn. All the controls are in this single screen. In the explanation we will walk through every interface element. Due to the character of the Alphorn we have decided to provide two versions of this instrument which can be toggled from the main interface with a selector switch: Natural or Extended. ‘Natural’ means the instrument will only play the notes available on the actual Alphorn (the nature tones up from a very low F), and we didn’t tune the harmonics to conform to modern scales. 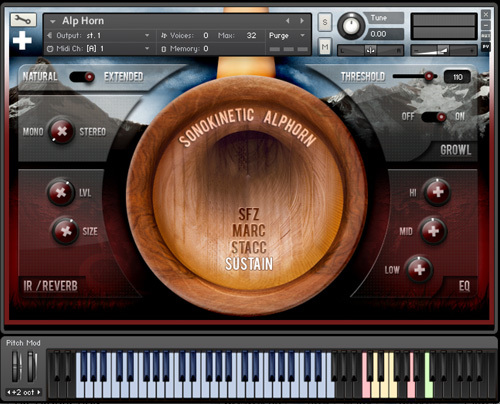 For the most authentic monophonic Alphorn experience with true legato, but with the restrictions mentioned above, use this mode. 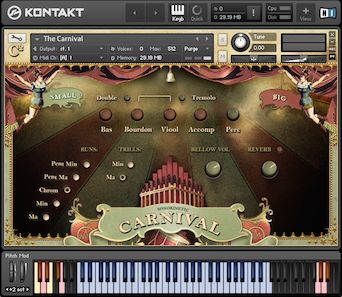 The available playable keys will be indicated by the blue keys on the virtual kontakt keyboard. 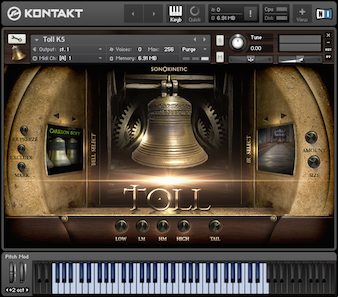 In ‘Extended’ mode we have used the power of kontakt to extend the range of the instrument to include all the in-between notes. In extended mode it is also possible to play polyphonic parts, but you lose the true legato, since we couldn’t record transitions that cannot be played on the actual Alphorn. To make the extended version even more useful for playing chordal passages with your virtual Alphorn ensemble, we tuned the instrument to approximate concert pitch. We’ve recorded the Alphorn with both a mono microphone setup close to the instrument and a stereo pair placed slightly further away. You can mix between these two microphone positions with this dial. Inside the Horn in the interface you can click to select one of four articulations. You can also choose these by using the keyswitches marked yellow and red on your keyboard. You can switch between Sustain, Staccato, Marcato and Sforzando. Note that the Sustain includes legato only in Natural mode, and is only capable of playing polyphonically in Extended mode. 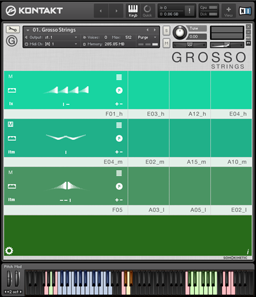 We recorded some nice ‘Growl’ type sounds, and these can be enabled on the higher velocities by turning the switch in the ‘Growl’ field to the ‘on’ position, or by pressing the velocity sensitive keyswitch on a5. Press the keyswitch with high velocity for growl on and softly for growl off. You can set the velocity threshold where it switches to the growl samples with the threshold slider. the number in the number field is the midi velocity above which ‘growl’ samples will be triggered. When playing Legato in the sustain articulation (with the instrument set to ‘Natural’) the amount of transition sound you will get depends on the length of time you overlap the key presses. So for the best sounding legato play overly slurred to make sure you get the entire transition. Some transition sounds will be less audible than others, due to the limitations of the actual alphorn in playing these transitions. In general, for fast playing, use the staccato or marcato samples, for realistic slow passages switch to the legato samples.